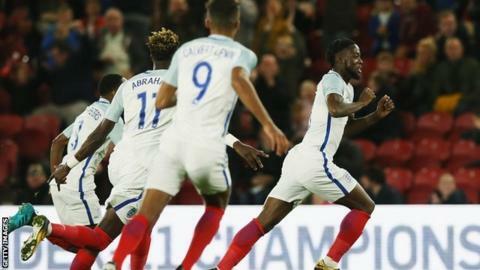 Josh Onomah's sensational first-half strike set England U21s on their way to a victory over Scotland U21s at the Riverside Stadium in Euro 2019 qualifying. The Tottenham midfielder controlled a looping clearance and sent a flying volley into the top corner. Tammy Abraham scored a second-half penalty to extend England's lead. Chris Cadden pulled one back in the 78th minute, but Dominic Solanke sealed the win just 62 seconds later. England are now top of their qualifying group with seven points, with only the first-placed team guaranteed a spot at the tournament in Italy and San Marino. Aidy Boothroyd's side could have scored more as Abraham, on loan at Swansea from Chelsea this season, hit the post early in the game and was also denied by Liam Smith's goal-line clearance in the first-half. Scotland, who have never beaten England at this level, opened their qualifying campaign with a 2-0 win over Netherlands and sit fourth in the group. Captain Oliver Burke, who played for the senior Scotland team in March and scored in the winner over Netherlands, was substituted at half-time and was rarely involved. Match ends, England U21 3, Scotland U21 1. Second Half ends, England U21 3, Scotland U21 1. Dominic Calvert-Lewin (England U21) wins a free kick in the attacking half. Foul by Scott McKenna (Scotland U21). Greg Docherty (Scotland U21) wins a free kick in the defensive half. Corner, England U21. Conceded by Greg Taylor. Substitution, England U21. Jack Harrison replaces Tammy Abraham. Attempt saved. Joseph Gomez (England U21) header from the centre of the box is saved in the centre of the goal. Assisted by Ademola Lookman with a cross. Corner, England U21. Conceded by Liam Smith. Allan Campbell (Scotland U21) wins a free kick in the attacking half. Offside, England U21. Josh Onomah tries a through ball, but Trent Alexander-Arnold is caught offside. Offside, England U21. Dael Fry tries a through ball, but Dominic Calvert-Lewin is caught offside. Jonjoe Kenny (England U21) wins a free kick in the defensive half. Foul by Greg Docherty (Scotland U21). Substitution, England U21. Ademola Lookman replaces Dominic Solanke. Substitution, Scotland U21. Greg Docherty replaces Stephen Mallan. Attempt saved. Stephen Mallan (Scotland U21) header from the centre of the box is saved in the centre of the goal. Goal! England U21 3, Scotland U21 1. Dominic Solanke (England U21) right footed shot from the centre of the box to the bottom right corner. Assisted by Tammy Abraham. Goal! England U21 2, Scotland U21 1. Chris Cadden (Scotland U21) right footed shot from the centre of the box to the bottom right corner. Assisted by Oliver McBurnie following a set piece situation. Foul by Lewis Cook (England U21). Foul by Josh Onomah (England U21). Stephen Mallan (Scotland U21) wins a free kick in the defensive half. Joseph Gomez (England U21) wins a free kick in the defensive half. Foul by Oliver McBurnie (Scotland U21). Foul by Tammy Abraham (England U21). Scott McKenna (Scotland U21) wins a free kick in the attacking half. Substitution, England U21. Jonjoe Kenny replaces Demarai Gray. Delay in match Oliver McBurnie (Scotland U21) because of an injury. Substitution, Scotland U21. Ryan Williamson replaces Dom Thomas. Attempt saved. Josh Onomah (England U21) right footed shot from outside the box is saved in the centre of the goal. Attempt missed. Dominic Solanke (England U21) right footed shot from the right side of the six yard box misses to the left. Assisted by Trent Alexander-Arnold with a cross following a corner. Corner, England U21. Conceded by Lewis Morgan. Attempt missed. Dominic Calvert-Lewin (England U21) left footed shot from the left side of the box misses to the right. Assisted by Demarai Gray. Kyle Walker-Peters (England U21) wins a free kick on the left wing. Read more on Scotland: What next for national side in play-off race? What are Southgate's big challenges? Read more on World Cup 2018: What are England boss Gareth Southgate's big challenges?